A key component of any online course is the discussion board. As online courses have matured, we now realize that not all discussion forums are or should be the same. Some discussions are for building community; other discussions are for exploring new ideas; others are for applying core concepts; and others are for gathering evidence of understanding. If the purposes of discussion boards differ, then how we structure, monitor, and evaluate the discussion boards should also differ. Other writers have identified many more purposes for asynchronous discussions (Painter, Coffin, & Hewings, 2003; Grogan, 2005), but in the interests of simplicity, this posting focuses on four types of discussions that can achieve most community and content goals. 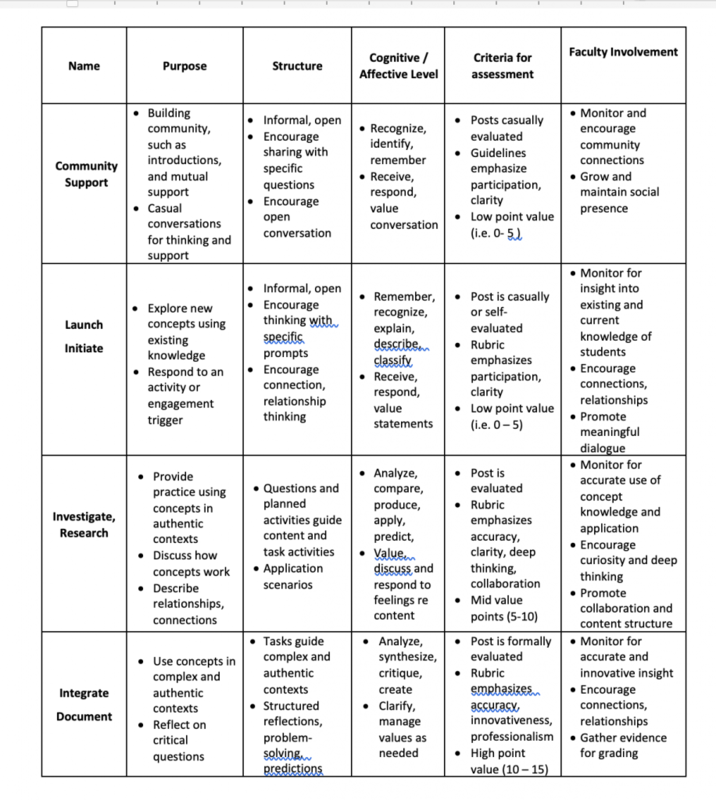 The table, Four Primary Discussion Types for Online Courses, summarizes the purpose, design, monitoring, evaluation recommendation and faculty involvement of four discussion types. Phase One: Concept Exploration. This is an activity that asks, invites students to think about what they already might know about a new idea, concept, or example or closely related concepts. The purpose of this activity is to twofold – to develop insight into students’ existing understanding and to encourage their curiosity about the new knowledge. When this activity is a discussion it is similar to a casual classroom conversation where students share what they think and where, when, or how they might have heard about a concept, person, idea or related event. Evaluation will be casual and students will earn full points generally unless it is obvious that students are not participating at all. Phase Two: Concept Introduction. This phase of the learning cycle introduces the new content in ways that build on the student’s understandings and builds the knowledge base needed to apply and use the knowledge. These activities might be brief lectures, student-to-student discussions, or simulations. Often students will start working with the ideas, researching possibilities and relationships and connecting the dots. Evaluation will be based on the level of engagement and how deep or broad their contributions might be. The rubric for this type of discussion will have more point values and varying requirements and expectations as to use of the core concepts and with sharing ideas with other students. Phase Three: Concept Application. This phase of the learning cycle includes activities in which students use the knowledge to solve problems, investigate related questions, and make predictions. This type of discussion is more substantial activity, possibly involving solving problems, working with cases, and working with applying concepts and integrating the new concept with other concepts and relationships. The posting/essay requires more substantial thinking and research, including citing important relevant readings, research, and doing problem solving. This type of discussion will have the most point values, and depending on instructional goals, more or less involvement with other students. This type of discussion might be one of the main sources of evidence of learning and will require more detailed feedback from the instructor. Research and the development of good practices guiding the design and facilitation of discussion forums in online courses are still in their infancy. But we should remember that the guidelines and good practices in face-to-face discussions in classrooms and other civil gatherings also have a long way to go. Our primary task for now in teaching and learning is to design and facilitate discussions so that the time students invest in reading and responding assist them in developing the knowledge, skill and attitudes of our desired learning outcomes. Note 1: Many thanks to Marlo G Hode, Ph.D, Academic Director, ACUE for suggesting this blog focusing on types of discussions and for generating the initial table. Note 2: Discussions about other questions about discussions such as the following can be found in the Course Beginning Tips (CB 10 – CB 17) in the book, The online teaching survival guide: Simple and practical pedagogical tips(2 ed) byBoettcher, J. V., & Conrad, R. M. Some of these discussions are also at the website www.designingforlearning.info, in the Teaching Tips library. How many discussions should I have each week of the course? How should I use the discussion forum? For community-building, casual conversation, for exploring new ideas, focusing on core concepts, for short essays, and reflections, or essays for gathering evidence of learning? Which discussions will I grade and with how much formality? Should I create different rubrics for the different types of discussion postings? 5.. How involved should I, as the instructor, be in the student conversations? Boettcher, J. V., & Conrad, R.-M. (2016).The Online Teaching Survival Guide: Simple and Practical Pedagogical Tips(2 ed.). San Francisco, CA Jossey-Bass. Grogan, G. (2005). The Design of Online Discussions to Achieve Good Learning Results. elearningeuropa.info. Retrieved April 8 2019 from http://www.elearningeuropa.info/en/article/The-Design-of-Online-Discussions-to-achieve-good-learning-results. Rovai, A. P. (2007). Facilitating online discussions effectively. The Internet and Higher Education 10(1):77-88, 10(1), 77-99.